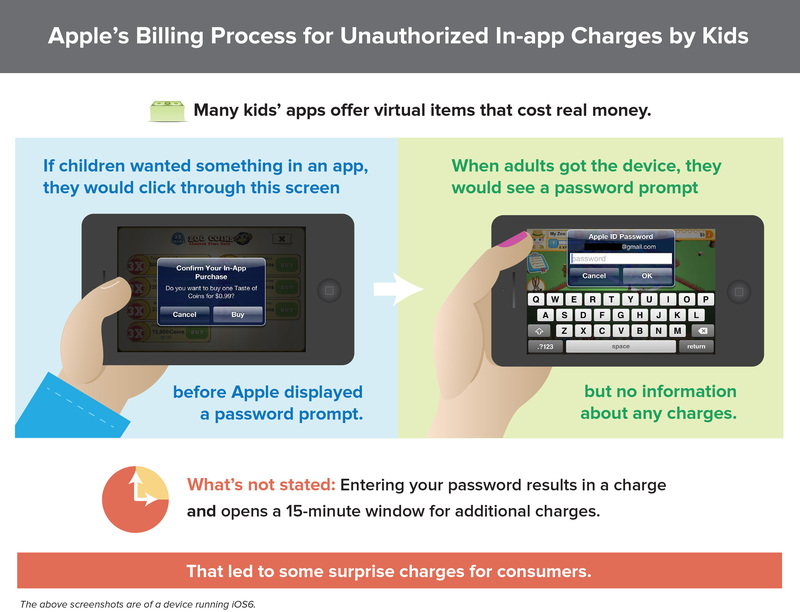 Apple offers many kids’ apps in its App Store that allow users to incur charges within the apps. Many of these charges are for virtual items or currency used in playing a game. These charges generally range from 99 cents to $99.99 per in-app charge. The complaint alleges that Apple does not inform account holders that entering their password will open a 15-minute window in which children can incur unlimited charges with no further action from the account holder. In addition, according to the complaint, Apple has often presented a screen with a prompt for a parent to enter his or her password in a kids’ app without explaining to the account holder that password entry would finalize any purchase at all. The rapidly expanding mobile arena has been a focus of the Commission’s consumer protection efforts. In addition to its consumer protection enforcement activity in the mobile sphere, last year, the FTC issued staff reports addressing mobile payments and providing recommendations for the mobile industry on how to protect consumers as new and innovative payment systems come into use, advocating improved privacy disclosures in the mobile environment, and addressing advertising disclosures in the context of mobile devices. The settlement requires Apple to modify its billing practices to ensure that Apple obtains consumers’ express, informed consent prior to billing them for in-app charges, and that if the company gets consumers’ consent for future charges, consumers must have the option to withdraw their consent at any time. Apple must make these changes no later than March 31, 2014. The FTC will publish a description of the consent agreement package in the Federal Register shortly. The agreement will be subject to public comment for 30 days, beginning today and continuing through Feb. 14, 2014, after which the Commission will decide whether to make the proposed consent order final. Interested parties can submit written comments electronically or in paper form by following the instructions in the “Invitation To Comment” part of the “Supplementary Information” section. Comments in electronic form should be submitted online by following the instructions on the web-based form. Comments in paper form should be mailed or delivered to: Federal Trade Commission, Office of the Secretary, Room H-113, 600 Pennsylvania Avenue, N.W., Washington, DC 20580. The FTC is requesting that any comment filed in paper form near the end of the public comment period be sent by courier or overnight service, if possible, because U.S. postal mail in the Washington area and at the Commission is subject to delay due to heightened security precautions. Staff Report: Paper, Plastic . . . or Mobile?